The Gala will take place at the Spiegelsaal of Clärchens Ballhaus. On September 13th 1913 Fritz Bühler opened the dance hall „Bühlers Ballhaus“ (Bühler’s Ballroom) in the back of Auguststrasse 24/25. It became known as Clärchens Ballhaus after Bühler was killed in WWI and his widow, Clara, took over the business. When exactly the fabled buildings were erected no one knows – official records were lost during WWII. It could be that they were commissioned by Kaiser Wilhelm II’s butler. But that might be just one of the many legends that surround the house, its inhabitants, and its patrons. Clärchens Ballhaus is, as it were, a kind of story machine, a site of conjecture. 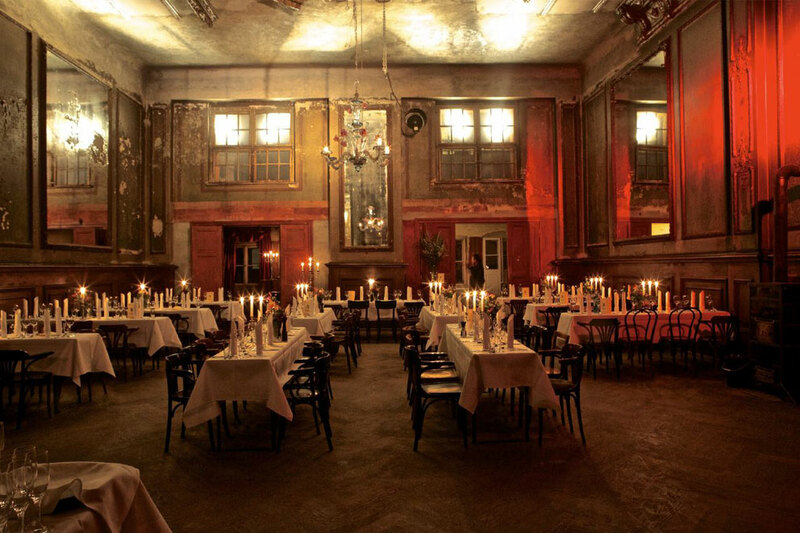 Dinner will be served in the Spiegelsaal, and afterwards you can go one floor down to move your body and dance until you drop in Clärchens Ballhaus - one of the most famous dance salons in Berlin. Visit the Reichstag, the seat of The Federal German Parliament. The Reichstag was built in 1894 to house the united German parliament; the terrible fire that was started there on 27 February 1933 not only gutted the building, but also was used by the Nazis as a catalyst for withdrawing basic freedoms. Foster’s renovations aim to establish a ‘dialogue between old and new’. The glass cupola materializes aims for political transparency and is open to the public for tours to the heart of government. The dome, rising like a phoenix from the flames, sheds light on the governmental workings below, thanks to energy-efficient mirrors. Walk from the Reichstag to the Brandenburger Tor. It served as a visual flashpoint for much of the trauma to have beset Germany in the 20th century—standing alone in no-man’s-land between East and West Berlin for 30 years during the GDR era and providing the backdrop to the euphoria of 1989. Walk via Unter den Linden to the Museum Insel. It’s hard to pick just one of the five museums on Berlin’s UNESCO listed Museumsinsel, but the Neues Museum is an unmissable highlight. Make time for the Pergamon, and Bode Museum, and Berliner Dome. Not to be missed is the Holocaust Memorial, Architect Peter Eisenman’s Memorial to the Murdered Jews of Europe is intentionally disorienting: it is a striking sculptural statement that invites visitors in, only to create a feeling of unease. There’s no vantage point or overview; to fully engage with the structure you need to walk into it. It’s haunting in places, especially on overcast days and near the middle of the monument, where it’s easy to feel a sense of confinement as you lose sight of the outside world; other visitors to the monument are seen in glimpses as they pass between the stelae, only to quickly disappear. 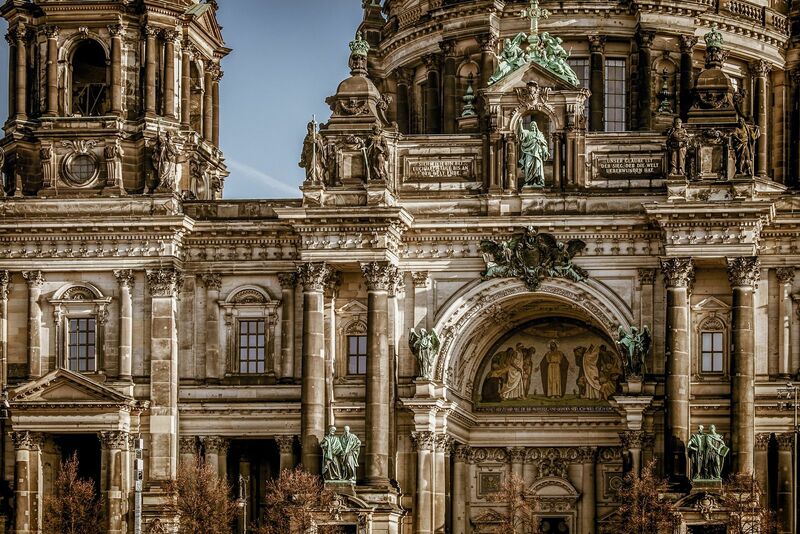 Go shopping in the Friedrichstraße, enjoy the Gendarmenmarkt, with its beautiful Deutsche and French Opera buildings. If you really want to see it, go to Checkpoint Charlie, and the left overs of the wall at East Side Gallery. Close to the Sofitel: the Kürfurstendamm with tremendous shops and the most glamorous warehouse to shop until you drop: KADEWE, and do not forget to have lunch on the sixth floor. More shopping and eating at the Bikini House, 8 minutes’ walk from the Sofitel, and since you are there, cross the street and pay a visit to: Kaiser-Wilhelm-Gedächtnis-Kirche, at Breitscheidplatz. Have a Curry Wurst at Curry36, Berlin Kreuzberg. Neni Berlin in Bikini House in Hotel 25 hours on top floor. Balagan style, which means pleasantly chaotic….Walking distance, reservations desired. Restaurant Reinhard's Kürfurstendamm, German kitchen with French flair…..walking distance, reservations desired. Café im Literaturhaus Wintergarten, Fasanenstraße, Bistro style, walking distance from hotel, reservations desired. Lutter and Wegner in Mitte, Schnitzel excellence, taxi drive or by subway U2.